Regular readers will recall that I installed two 50-gallon barrels in May. Except for a week or so in June, they have been full and I’ve been able to limit my water use in the garden. We’ve had plenty of rain in St. Louis this summer, which doesn’t represent a typical summer for the rain barrels.So far this month 5.21 inches of rain has fallen in the metropolitan area. Typical August rainfall is 2.99 inches. July rains filled the rainbarrels to overflowing when we received 8.37 inches, slightly more than double the monthly average of 4.11 inches. And June rains of just 1.29 inches put the barrels to work, and I drained them watering the pots and garden beds. Overall, I’m enjoying them. I think in a typical summer, I would be supplementing with the hose much more than I have this year. When I water, I simulatenously fill both a bucket and watering can. Because the water pressure in the barrel is limited, containers are a little slower to fill. I rely on the hose when I’m either too lazy to wait for my containers to fill up or I’m in a hurry.I have no doubt, though that I have saved water. Strange to say, but I actually look forward to receiving my summer water bill to see how much I have saved versus last year. I’ve attached a short hose with a spray attachment to one of the barrels, but, again, there is not enough pressure for the spray attachment. As you can see below, debris from the roof runoff collects in the top of the barrel. This can clog a small overflow hole near the top, so I keep a small stick handy (kabob skewer works well too) to unclog the hole so that standing water doesn’t attract mosquitos. Categories: Musings, Uncategorized | Tags: rain barrels | Permalink. The marketers of the rain barrel say this is a good spot for a plant. I don’t think so. It would block the overflow hole (see picture below). Also the front has a lip of sorts to also allow rain to cascade down the front. Here’s a rain barrel update. The water stinks. In about one short month’s time, I have noticed that the water coming from each of the two barrels has an malodorous quality. There’s also a slight greenish/yellowish tinge to the water. This was not the case the first couple of weeks of use. The barrel relieves itself of water when full. The lip at the top also releases water when full. While I knew there’d be some maintenance needed, I didn’t think it would be so soon.The barrels have a small screen in the top where the water drains in. Other than that, the system is completely enclosed. There is no removable lid, which in hindsight may not be ideal for dealing with clean out issues. I do know that there is no critter in there and there is no leaf/treat/plant debris in there because the opening in the screen is too small. It’s amazing the amount of debris that comes off the roof. I immediately turned to the Internet for help in diagnosing this problem.Probably causes: pollen in the water, algae growing in the water. Apparently it is not uncommon for the barrels to take on an odor during the spring pollen season as the pollens are deposited in the barrel along with the rain. The common antidote seems to be to drain the rain barrels or to quickly use the water following a rain. I’m not going to do that. Both remedies seem counterintuitive to having them in the first place. I don’t want to get rid of all that water I am capturing in an effort to keep it out of the sewer system. And, my garden doesn’t typically need to be watered right after it rains. Especially in the spring when the temperatures are mild. Another common cause for stinky barrel syndrome, as I’ve decided to call it, is standing water at the bottom of the barrel. Obviously that is not my problem. My barrel has two spigots–one up high and one down low. The lower spigot is near the bottom so that should not be a problem as I get into the dog days of summer and am draining them to water my thirsty garden. What to do? What to do? I needed to find a remedy for the smell before it became too awful. And there are lots of ideas out there. Add baking soda to the barrel. Add vinegar to the barrel. Add baking soda AND vinegar. Add bleach. Install the barrels in a shady spot (now you tell me!). Add cedar oil or cedar chips to the barrel.Use a commercial algae killer. And there are those who say leave it alone, the microorganisms in the water are good for the plants. Further research poo-poo’d the vinegar idea, saying it will only make the problem worse. I decided to add 1/4 cup of bleach to the barrel. It seemed the quickest solution I have on hand. I have only taken a small amount of water from them since I did this because we’ve had lots of rain (about 2 inches this week) but I didn’t notice an odor. Is it because of the fresh water coming in and displacing the funky water or is it the bleach? Time will tell. How do you keep stinky rain barrel syndrome in check? Categories: Musings, Uncategorized | Tags: rain barrels, sustainable gardening | Permalink. There’s nothing like the need for new gutters to finally motivate me to install a couple of rain barrels. I’d been thinking about installing barrels since I moved in five years ago and even more so when I found myself constantly watering a newly planted parched garden bed baking in the 105 degree heat that second summer. My two 55-gallon barrels have arrived and are already full. That’s right. One rain gusher filled them to the brim. I live in a modest ranch-style home, approximately 1200 square feet if that helps you in picturing just how much rain runoff is going on here. I’m always interested in conserving resources and being as “green” as I can–every day is Earth Day. The Metropolitan St. Louis Sewer District’s web site cites an EPA stat that 40 percent of home water use is for landscape and lawn needs. Rain barrel proponents tout the devices as a low tech way to tap into a free supply of water that would otherwise drain into the sewer system. I’d agree with that–they are low tech–but given how fast they have filled up, and watching the overflow feature cascade rain off the front of the barrel, I’m not sure I’m saving that much storm water from entering the sewer system. I’ll know at the end of this garden season if they made a difference in my water bill. I do derive small pleaure in filling up my handy dandy watering can with abandon and have yet to turn on the hose for watering. Although each barrel sits on a makeshift platform, water pressure is low. That’s okay, I’ve got patience. While one watering can is filling up, I am watering with a second or doing something else. Many sites claim the water that is coming off the roof is better for the plants than the water coming from the house system. That’s because it is softer because it is low in salts and chlorine. Unlike tap water, fresh rain water does not contain flouride compounds.Still, you don’t want to drink this stuff. There’s lots of nasty coming off the roof. Many web sites have FAQs that discuss if this is water that can be used to water vegetables. Short answer is yes but water the soil not the plant directly. Aesthics are important to me. Color, size and shape were all carefully considered. I wanted a barrel that blends into the landscape, not competes with it. Then there are the practical considerations: spigot type (plastic versus brass–I chose brass), overflow mechanics (mine have a front overflow design, no diverter), barrel openings (only a screen for inflow). Not sure I like the fact that I can’t pop off the lid of the barrels at the end of the season. I will have to unscrew the inflow screen to clean and empty them. I spent lots of time looking for the right rain barrel and read review after review. Common complaint is that they leak. One of mine was leaking at the spigot but I didn’t have it tightened in properly and that problem has been resolved. A common feature is that you install a plant on the top of the barrel. I don’t plan on doing that but can see how standing water in this reservoir will be a mosquito draw. I am, however, planting fern around the base of one of the barrels to obscure the stone perch it is atop. I plan to extend a small hose to the soaker hoses in my shade bed for deep watering. Will let you know how that works. What do you think of rain barrels? Categories: Musings | Tags: Earth Day, gardening sustainability, rain barrels, water conservation | Permalink. 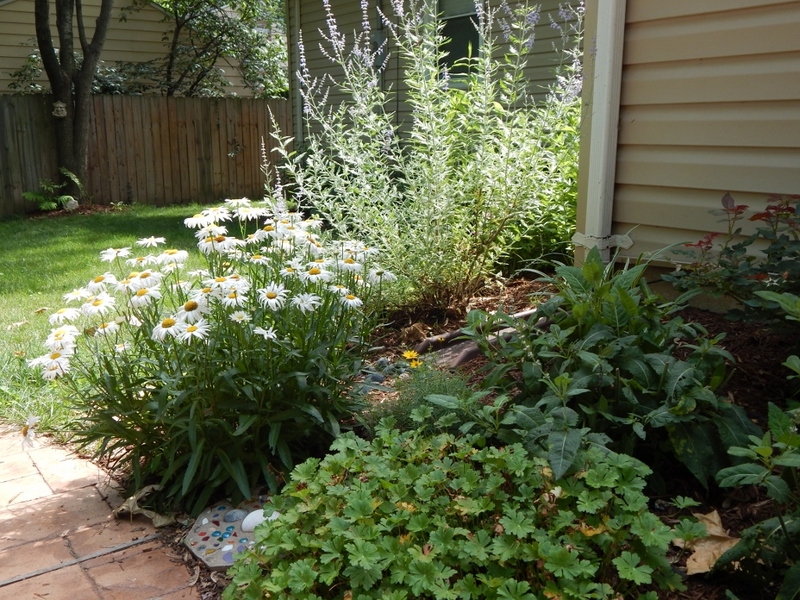 What does your garden landscape say about sustainability? This is something I am thinking of more frequently for a few reasons: to protect the watershed, to reduce/maximize resource use and reduce expenses. 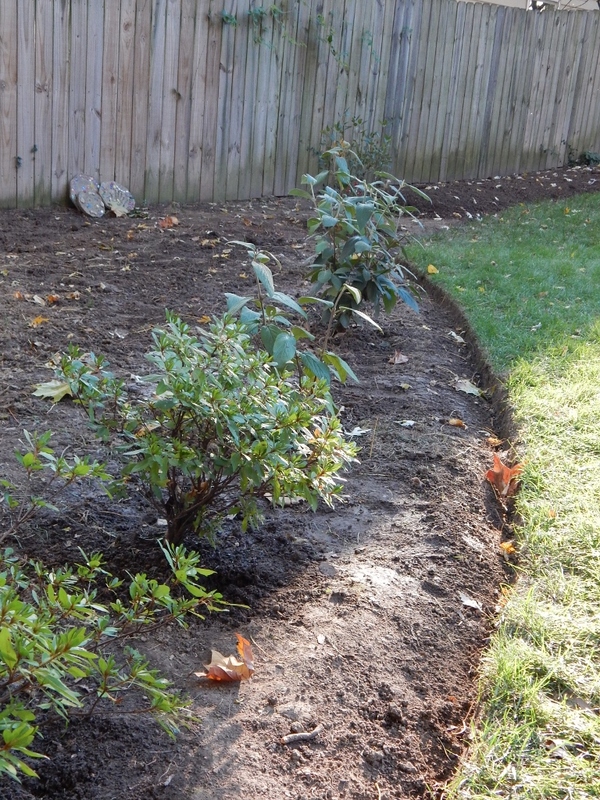 As I began creating my backyard garden, my focus was on installation of low-maintenance plants and shrubs, with an emphasis on shrubs suitable for the conditions in plant hardiness zone 6a/6b. With that in mind I selected plants that are drought tolerant and some natives. I had tried composting at the old house when the kids were little and I had very little time to devote to the garden or yard, other than to pick up the toys before we mowed or move the hose. With a pallet as my base, I constructed a container in an out-of-the-way corner in the yard using heavy gauge wire. I put PVC pipe that we drilled holes in into the center of the compost and dumped in the leaves from the stately oaks, dogwoods and maples that freely dropped mountains of leaves in the fall and when I thought of it some grass clippings. I watered it now and then and really just forgot about it…for a few years, actually. I don’t think I turned it more than once or twice a year. It seemed the most attention it received was in the fall when I filled it up with new leaves. One day a few years later, I noticed it had reduced to a pile of, well, dirt. The next spring I added the composted material to the dry shade area of the yard where I was coaxing hostas to grow with some limited success. And what a difference it made! Truly.That corner of the yard that year was lovely and I attribute it to the compost. But I did not become a compost convert. Honestly, I don’t really think I was doing it right. I mean, it took years for the stuff to break down. But like the bees I am trying to attract with my perennial selections (or maybe it’s the murmurings of my 20-year-old daughter in my ear), the idea of composting is buzzing in the back of my head. The benefits are many from putting nutrients back in the soil to reducing waste and reducing fertilizers. And, my oh my, there are lots of products out there for the backyard enthusiast. Pinterest posts lead me to believe composting is Not a Big Deal. When I read about putting a banana peel in the soil by the rose bushes, I think, “Now THAT’S the lazy man’s compost!” Or putting a whole egg in the bottom of a container to feed the plants throughout the season. Do these natural tips really work? I don’t fancy myself as lazy, more like time pressed, and I do like a short cut or two. But I don’t think I will be burying banana peels in the rose beds any time soon. My only true reservation at this juncture is where to place a composter. I envision buying one that has a crank where you can turn the bin. Unlike my last address, I have very limited space and, frankly, I think the compost bins on the market are hunky, clunky and ugly. I don’t want it up next to the house. 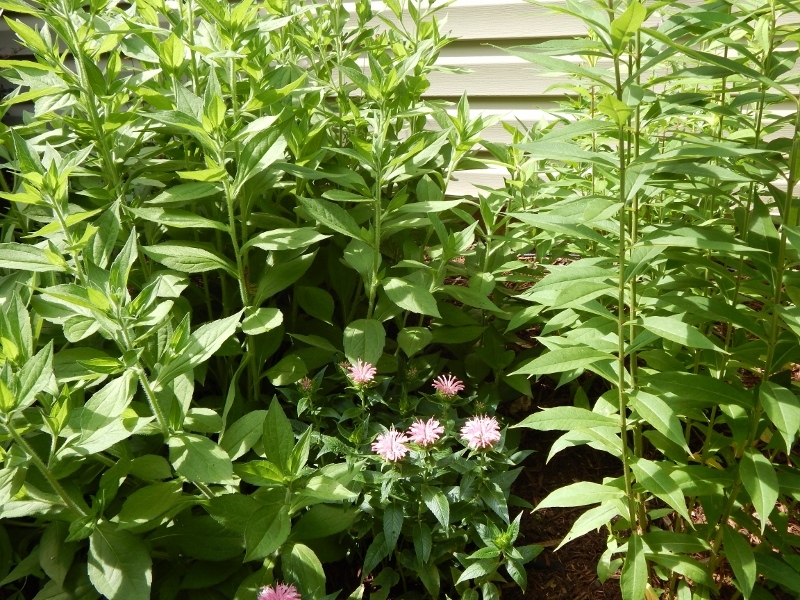 Last fall, I put in three leatherleaf viburnum and moved some azalea to the front of a wedge-shaped area that behind it is very shady and often wet and I’ve had difficulty getting much to grow there. I did this with the idea that the viburnum will grow tall create a nice screen for something like a compost bin or even some of the garden essentials, such as the wheel barrow, that don’t fit into my one-car garage. Let’s hope the viburnum are in the right place because the buzzing from my 20-year-old makes me think a kitchen composter is in my future for Mother’s Day. Categories: Musings | Tags: compost bins, Composting, Pinterest, rain barrels, sustainability | Permalink.